Have you ever bitten into a Whopper and thought, "You know, this Whopper could really use more meat on it!"? Probably not. But if you did, that's what the Double Whopper is for, ya dummy. 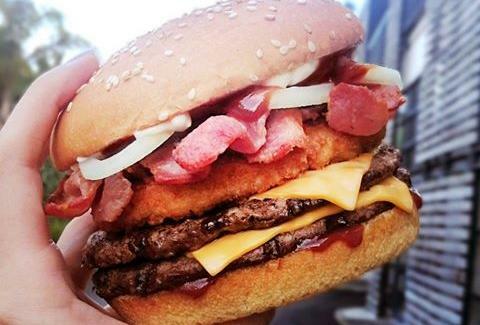 But if somehow you still don't have enough protein between your buns, rejoice: Burger King New Zealand has unleashed a burger with more meat onboard than you'll find on a Chippendale's stage. Behold: the Big Meaty. 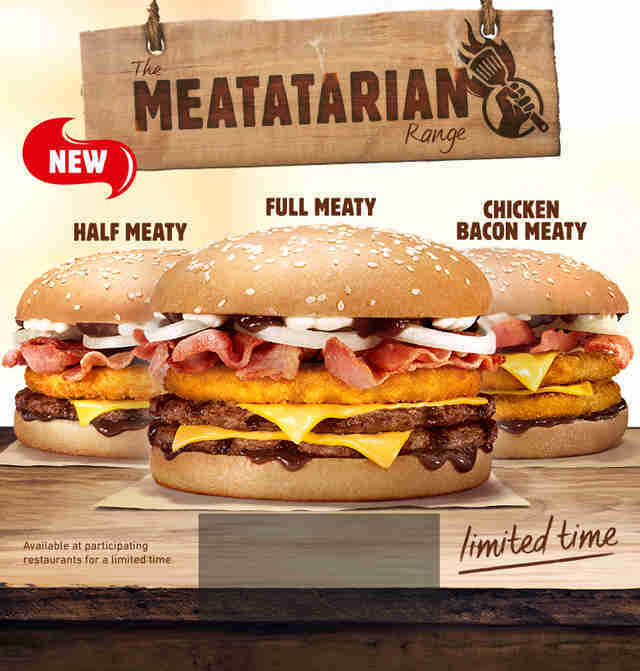 Featuring two flame-grilled beef patties, a crispy chicken patty, six bacon strips, two slices of cheese, BBQ sauce, mayo, and onion on a sesame seed bun, the Big Meaty is part of the chain's new "Meatatarian Range" of offerings, which also includes The Half Meaty, with one patty and one slice of cheese fewer, and the Chicken Bacon Meaty, which, as you'd guess, delivers two chicken patties and bacon. Mmm. Infarctions. Nutrition-wise... honestly, do you even care? It's not listed on the BK nutrition facts menu, since the Meatatarian Range is a limited-time offering. Just know it's horrible for you, and you're not plowing through one of these because you're on a diet. It's decidedly the anti-diet. Anyway, if you happen to be in New Zealand, you can eat one of these. If you're not: well, you can't, for now. Your cardiologist is probably already thanking you for that. Ryan Craggs is Thrillist's Senior News Editor. He would eat the Big Meaty. Follow him @ryanrcraggs.